ONCHAN, Isle of Man – May 11, 2017 – UK postman Ben Scott, 26, of Roker, Sunderland, is set to win a “life-changing” £50,000 after online betting site BetStars, an Amaya Inc. (Nasdaq: AYA; TSX: AYA) brand, offered enhanced odds of 5,000-1 on his £10 bet for Chelsea to win the Premier League title. “I was stunned when BetStars called me before the season to say my bet had been enhanced to 5,000-1,” Ben said. “I’m a big Sunderland fan so it would be a massive silver lining for me after my team were relegated. This season, I’ve watched every single Chelsea match and all of Antonio Conte’s press conferences. I’ve become pretty obsessed. The Sunderland fan posted the bet before the start of the season and received promotional odds of 5,000-1 from BetStars, the same odds Leicester City overcame to win the 2015-16 league title. Ben’s original bet of £10 for Chelsea to be champions was placed against 5-1 odds and would have won him £50. He now stands to score £50,000 if the Blues win the league. Chelsea lead second-placed Tottenham Hotspur by seven points with three matches remaining and the Blues could secure the title as soon as tomorrow evening (May 12), if they win away against West Bromwich Albion. Zeno Ossko, Managing Director of BetStars, said: “Ben has proved his sport smarts are absolutely first class. 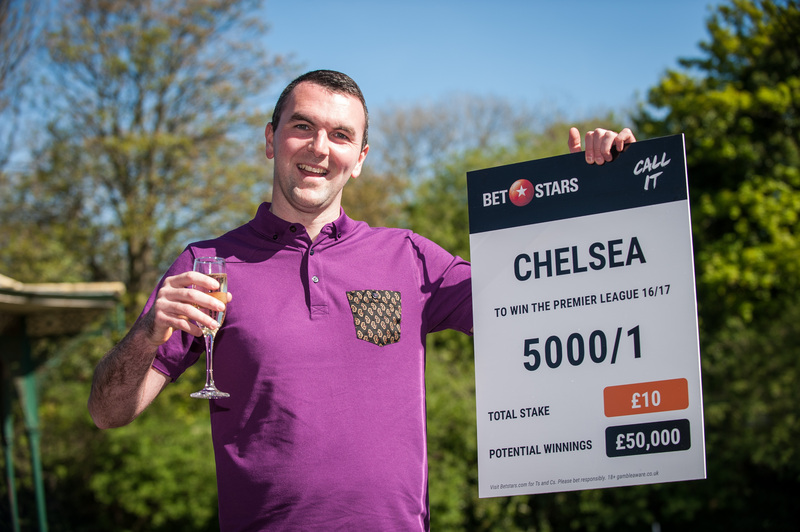 He called Chelsea as Premier League champions before a ball was even kicked this season and has scored himself £50,000 in our 5,000-1 special offer! “At BetStars, we celebrate those willing to make big calls. We’re delighted to reward Ben and hope he enjoys his big win as much as Antonio Conte’s side enjoy their title celebrations.